So, the program went out on Monday (and can be listened to on-line for those who missed it) and IMO they covered the issue very well. In fact the whole program was interesting - I'm a bit embarrassed not to have discovered it earlier. The presenter seems to do a lot of interesting things - he also has his own webpage/blog. David Whitehouse stated very clearly on the program that he would bet £100 against a new record by 2011, although I've not yet had a reply to the email I sent on Monday. If any reader knows him directly, I'm be grateful for some contact. In the comments to my earlier post, Chris Randles seemed a bit sceptical of my justification for why I think the bet is a good one (and why I think 30% per year is a reasonable estimate for the probability of a new record in 2009-2011), so here's a bit more background. Actually 30% was partly an inverse calculation, "what would the probability have to be to make the bet an attractive one", but I don't think it is overly optimistic, for the following reasons. First, here is a bit of Fig 10.4 from the recent IPCC report. 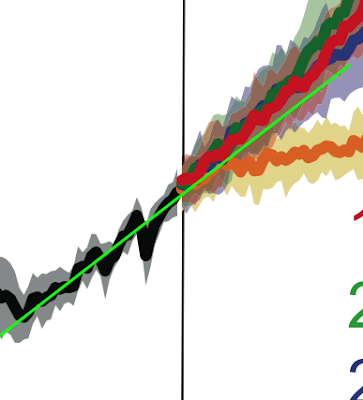 The left hand half consists of the last 20y of the models' historical 20th century simulations, and the right half is the first 20y of projections under various scenarios. The yellow/orange future is for fixed atmospheric constituents (at year 2000 values) so is not at all realistic, but the other scenarios all show a near-linear response on average. I drew on the green line by hand, but it has the right slope for the historical trend. The point here is that for all models under all plausible scenarios, the climate response is very close to linear plus natural variability "noise" over this sort of time scale. In fact the models tend to show a modest increase in trend, although I personally would not be too surprised if this does not actually transpire. But over the next 5 years that is not an issue anyway. This linear response is a well-known property of the system, basically due to thermal inertia and the steady ongoing increase in CO2. The only real question is, what is the true underlying trend? Now here's a modified version of the graph I showed last time. Here, all the blue lines are the even-year trends from 8 to 40 years duration, extrapolated out to 2011 (I just chose even numbers to limit the clutter). Most of these exceed the 1998 record before 2011, some by quite a lot. I've also put dots on the 30y trend line (a rather arbitrary choice, but actually one of the lower trends) just to show that it crosses the 1998 record between 2010 and 2011. Some important details: the residuals have negligible autocorrelation, so it is reasonable to consider each year's anomaly (compared to the trend) as independent. Also, the RMS of the residuals is about 0.08, and the 1998 value is 2.5 standard deviations (a 1% event, if we assume Gaussian residuals, which I would not hang my hat on but it's a reasonable starting point). None of the cold anomalies are that extreme, not even those due to the Pinatubo and El Chichon eruptions. In fact the cold anomaly in 1996 is greater than either of those, with no volcano to explain it. The 2007 cold anomaly is also an entirely unremarkable 0.8 standard deviations, and all 5 years from 2001-2005 were above the trend line. So there is absolutely no evidence of any strange cooling in the recent record - it's just that 1998 was abnormally warm. Using a conservative "underlying" temperature anomaly of 0.5 (on that scale) over the interval 2009-2011, we only need a further 0.026 due to natural variability - about 0.3 standard deviations, a 40% event - to break the old record. So that makes my 30% guesstimate seem a touch pessimistic. Of course the historical trend may be somewhat "contaminated" by some natural variability or other forcings. But this may work either way, it arguably increases the uncertainty a bit but should not bias the results significantly (in fact an increase in uncertainty for the trend in future temperatures would make the odds closer to 50% for each year, which is better for me). Finally, this is from Smith et al which I talked about earlier. I've added on a couple of lines as guides. The green one is just the trend, extrapolated (again positioned by hand but the slope is right). This plot uses seasonal anomalies so the link to annual average is not perfect, but it should be good enough. 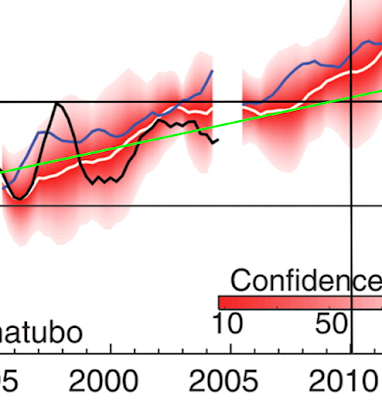 Their own model forecast (white line with red shading) exceeds the old record from 2008 onwards, with high confidence. In fact their paper contains the explicit statement that "at least half of the years after 2009 are predicted to be warmer than 1998, the warmest year currently on record." Actually on re-reading it that phrase is slightly ambiguous, I suspect they mean that each year from 2009 will beat the old record with probability 50% or more (obviously if you run out far enough into the future then the vast majority of years will break the old record). So according to that statement, I've got a 1-0.53 = 87.5% chance of winning. 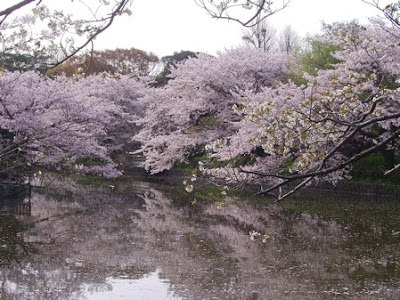 Today is "Green Day" (actually, I just found out that Green Day was moved to the 4th May as of last year, and the 29th April is now called Showa Day after a previous Emperor, but the trees didn't get the memo). 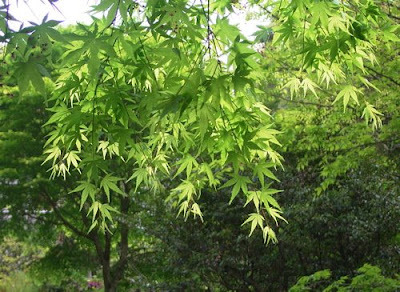 Japan is good at green, in fact at this time of year it is luminously, luridly, effulgently, almost virulently green with the fresh leaves brightly lit up by the increasingly powerful sun. This picture from our walk today certainly doesn't do the scene justice, but I hope you get the idea. This was taken half-way up the hill to Hansobo out the back of Kenchoji (or rather half-way down the hill to Kenchoji, on the route we took). 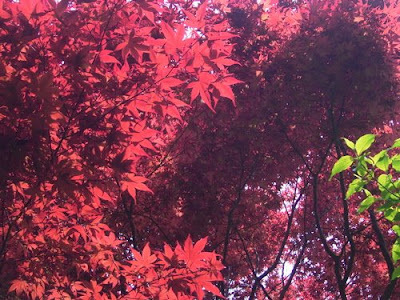 Some of the greenery is red, of course. I left a touch of green in the next picture to prove this wasn't taken last autumn. It's a more ornamental variety of Japanese maple, this one in Zuisenji a few days ago. This has been done to death all over the blogosphere (eg here, here and here), so I can hardly bring myself to post about it. However, I do have one minor contribution to make. First, the basics. Most of you will have noticed that various sceptics have been crawling out from under stones with variations on "global warming stopped in 1998". Of course, the temperature in 1998 was exceptionally hot, due to the strongest El Nino on record. And according to HadCRUT, we haven't quite exceeded that temperature yet (although according to the NASA/GISS analysis, 2005 just pipped it). Here is the HadCRUT surface temperature record, with 30 consecutive 10-year straight line fits overplotted in blue. Note how the last of these, 1998-2007, still has a positive trend despite starting right at that cherry-picked high point. However, there have been 3 different 10y intervals with lower trends even during this period, with the more recent one covering 1987-1996. That does include the 1992 Pinatubo eruption, but even correcting for that would still leave it no higher than the 1998-2007 trend. Anyway, global warming can hardly be be described as having stopped since 1998 when the trend starting in that year remains positive. One of the sceptics who has waffled on about global warming having stopped is is a person called David Whitehouse, who I must admit I'd not heard of prior to that linked article. Mark Lynas has written a perfectly adequate rebuttal, so we don't need to dwell on the argument any longer. But thanks to "More or Less" (today at 16:30 on Radio 4, I just discovered) I may have a 100UKP bet with David that there will be a new record temperature by 2011 at the latest. As I said in the interview (whether or not it ends up on the cutting room floor), I don't think this is a sure win for me, but I do think that the odds are clearly in my favour. Even writing off 2008 (since it's started a bit cold), that leaves 3 more years, and if each one has only an independent 30% chance of beating the old record, then that gives me a 0.73= 35% chance of losing and therefore 65% chance of winning. That's without any careful analysis of whether an El Nino is likely to turn up (surely the next decent-sized event will result in a new record), just from eyeballing the graph. The Smith et al Science paper puts the odds better than that, I think. A review of "Japan through the looking glass" by Alan Macfarlane. We heard the author as a guest on late night Radio 5 last year, talking about his new book, which sounded interesting. So we got it for Christmas. He's a professor at Cambridge University in cultural anthropology who has visited Japan extensively, so we were looking forward to finding out if he could provide any insight to help us make sense of our experiences - or whether conversely, he wouldn't be able to tell us anything we didn't already know. Perhaps most importantly, would he explain the Japanese approach to scientific research? 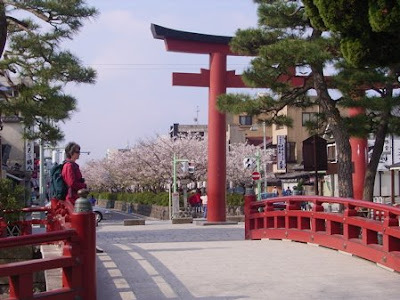 The author has not lived here for any extended period of time, and does not speak the language, so was highly reliant on the various contacts he had during his visits (which have mostly been stays at a number of Japanese universities). This unfortunately shines though his writing in some places, and made us wonder who was really writing the book, and for whom. For example, he starts on an unfortunate note by quoting a judge who explains that the reason they take so long over their legal decisions is that the Japanese take a nuanced view of things, life is not black and white. However this can hardly be reconciled with the 99% conviction rate, whether or not one accepts the claims that only the guilty are brought to trial. Indeed to anyone who has followed any of the dubious high profile cases here it seems much more plausible that the lengthy delays are caused by the judges agonizing over just how brazen they can be in discounting any evidence of innocence on the flimsiest of pretexts. There are plenty of other places where the book reads like the Japanese intelligentsia explaining away Japan's less admirable qualities, like when he talks about the "separate but equal" status of women here (no, he doesn't actually use those words, but might as well have done). There are some well-made points: the way that the Japanese have imported all sorts of Western ideas but completely gutted the essential nature of them, often apparently without even realising that they have done so. For example, their "democracy" in which everyone dutifully goes out and votes for the governing party every few years (a year ago, the opposition actually got a majority of the vote in some elections for the upper house, which panicked them into proposing a merger with the govt). But as for his comments about consultation and "nemawashi", he is either very wrong, or JAMSTEC is a particularly unusual employer! Again, it is easy to envisage some academics talking about the process of "consultation" and consensus-building without perhaps realising what a complete sham the process is, compared to (say) the UK system where the workers do actually have some teeth (backed up by legal force and due process). For example, we have a "worker's representative" here, who is proposed by the management, elected in an unopposed public ballot ("sign here if you approve"), and who dutifully sits through "consultation" meetings in which he is told what the management have decided to do. I asked a colleague about this process, and she said she did not even know who he was but had voted for him anyway...but I'm supposed to be talking about the book, not my own petty grumbles. A major focus of the book is how Japan's society seems inside-out from the Western perspective, but nevertheless seems to work just as well. Some of his examples reinforce our own experiences, but others seem rather flimsily supported, based on nothing more than an anecdote. Although I'm no great expert, I think his comments about Japanese language are as often wrong as right. Among the latter, I'd noticed myself soon after arriving that my dictionary translates "kenri" as "right, privilege" and that the Japanese appear to have no clear concept of the difference between the two terms (which directly feeds into their understanding - or otherwise - of human rights). But contrary to another of his assertions, it is easy, and indeed common, to communicate in an equal-status manner - and the range of relationships considered "equal status" can be rather broad - although some relationships like staff-customer do invariably use status-laden language. The underlying theme that runs like a coal seam through the book concerns the tribal nature of society here. I'm not sure how much of this is a synthesis of other writers versus his own analysis. Probably everything has been said before: the skill may be in drawing out the important and useful bits. But anyway, perhaps the cornerstone of his analysis is that (due to its isolation) Japan never went through an Axial age, at which time (elsewhere in the world) the human sphere started to be considered as separate system from the natural world - and therefore subject to separate ethical rules, initially religious, perhaps now more secular but still moral and prescriptive in nature. Hence no "human rights", and no separation between mankind and nature. Society is still an undivided whole, and laws are more of a guidance for social cohesion, than a rigid structure based on assumed principles. We (or rather, the Japanese) are all part of the same compost heap, with their existence defined only via their relationships to others, rather than in themselves as human beings. Mind you, AA Gill said much the same thing in a rather cruel but very funny article many years ago: "a Japanese man by himself doesn't think he exists." As for what else we learnt, or at least came to accept and understand more fully: the Japanese won't change, at least not in the ways that we would like them to. We'd actually got that far by ourselves, but the reasons behind that make more sense to us now, as do various minor events that have happened during our stay here. Ultimately it's hard not to feel sorry for them, trapped in their individually helpless situations, where life is something that happens to them while they don't even bother making other plans. But I have to admit that most of them seem happy enough with it (or maybe resigned would be a better term), and on a practical level, life runs very smoothly. It is difficult for me to tell whether I am attracted or repelled by Japan; indeed most outsiders who know Japan feel both these emotions. At times it all seems so beautiful, meaningful, attractive, a return to paradise, Eden, childhood and security. It fulfils the romantic longing for a lost world, Paradise, Atlantis, the Lands of the Grail, fairylands forlorn. Then when one awakes from the dream, Japan seems a savage, childish, conformist and aggressive land, clogging, sticky, regressive, a trap, a siren song leading to shipwreck for the Enlightenment and reason. Japan is full of hybrids, ambiguities, full of attraction and repulsion simultaneously, absorbing people and also rejecting them. I see that the Amazon page now has 4 reviews: two think it is is wonderfully evocative and fascinating, one thinks it's too academic, and one says "I'm the only gaijin in the village". That's probably a fair mix of opinions. Biofuels have been getting a lot of bad press recently - lots of it justified I'm sure (many schemes seem to have at best a marginal net energy surplus) but there's one aspect I'm a bit puzzled by - the worry over increasing food prices and the effect this will have on poverty. I had always thought that the standard received opinion was that poorer countries were basically agriculturally-based and food-exporting, and indeed that it was primarily the hegemony of the evil West that kept them this way by suppressing the global market price of their outputs (by subsidising their own agricultural sectors and/or imposing various trade barriers). But if that is true, then rising food prices should be a good thing, surely? They'll get more for their exports, and our technology will be (relatively) cheaper. I have this probably naive view of subsistence farming as the bottom rung of economic development - and anyone below that rung in economic terms is already dependent on aid. At the national level, if a poor country is a net food importer, then I have to wonder what it is they are exporting to pay for that food in the first place. Of course there will always be some poor people within the poor countries who will struggle to buy food - but the existence of (much) poorer and richer people within a specific country is surely first and foremost a local issue to do with national governance, not an international one to do with food prices. I hope an economist (or indeed anyone clued-up on these things) can point out what I'm missing. I was going to write about the frogs, but the longer I delay the more stuff comes up and now this is going to be a rather lengthy post...I'll start at the beginning and see where I end up. You may recall this story from 2 years ago - someone claimed that scary global warming was killing all the poor frogs. Well, now a mere two years later, other researchers have published a paper which argues strongly that climate change is at most a minor player in this process. That seemed pretty clear right at the start, to some people at least. The lesson here is that yes, science does tend to be self-correcting, but it can be a painfully slow process, and an over-hyped story will be round the world years before the more nuanced version has got its boots on. The Pounds paper has been cited by 155, including the IPCC (uncritically). This is hardly an isolated example, either (eg see also Bryden) - John Fleck has coined the phrase "the Nature effect" for cases such as this. It is IMO notable (and this is my second point) that the paper attracted intelligent and pertinent criticism in the blogosphere immediately after publication, well before the wheels of the peer-review process started to turn. Those two blogs I linked to are both people I've had plenty of disagreement with in the past (and probably will do in the future), but as I said at the time, that doesn't mean I will jerk my knee and reflexively dismiss anything they say, just because of who said it. Unfortunately WCR rather spoil things with their unthinking endorsement of Chylek's silly paper on paleoclimate and sensitivity - it seems their critical faculties only apply in one direction. So it's definitely a case of reader beware, but the fact remains that the truth certainly can get out there a lot faster in electronic media than through peer-reviewed publication. Of course this relies on some of the bloggers having a clue about what they are writing, which pretty much requires at least some scientists to participate. So from the POV of my post, it is timely that Nature Geoscience has published a couple of commentaries on the value (or otherwise) for blogging, with Gavin Schmidt on one side, and Myles Allen on the other. There's discussion on RC of course. Gavin puts the case well enough - I can't imagine he found it a taxing task, as the case pretty well makes itself. Given that the internet (and blogging) exists, it is hardly credible for science as a whole to turn its back on this avenue for communication. Myles struggles to pitch blogging against the peer review system, as if they are somehow in competition. Perhaps it's too easy to just say I endorse John Fleck again. So I'll flesh out the point a little with some examples. You may recall the Schwartz paper which claimed to prove that climate sensitivity was very low. Of course it was easy to see substantial problems with the paper. Months later, our Comment is still mired in the review process (it does at least seem that it will be published eventually) but my blog posts have already been repeatedly cited in discussion about the paper, usually to rebut sceptics who are promoting it as the latest proof that global warming is a myth. (Perhaps this can be dismissed as "just the web" but one can't simultaneously argue both that no-one takes the web seriously and also that it actually undermines more traditional media.) So I see no reason to regret, or apologise for, putting the evidence out in the open before it had been peer-reviewed. I also don't feel under any obligation to follow up the rather straightforward and elementary criticism of Chylek (also here) with submitted comments, although I haven't entirely ruled out the idea. Let's not forget that peer review is hardly a faultless process - I don't necessarily disagree with Myles' assessment that it's the best system that we have, but it is well known that it is strongly biased to maintain the status quo, and routinely misses substantive errors. At its best, the careful opinions of unbiased colleagues can greatly improve the clarity and content of the paper, but the minimum threshold may simply be that two of the author's pals (yes, authors generally get to suggest some reviewers, and editors may not have the energy or expert knowledge to go outside that list) glanced over the article and didn't think that it was so bad that it was unpublishable. There is not even necessarily the implication that they think it is right, merely that they think the case is arguable. So let's not get too excited over peer review as some stamp of approval or validity (or conversely, as rejection meaning a paper is necessarily wrong). It's one piece of evidence, of uncertain strength. "If, as a scientist, you feel you have to communicate non-peer-reviewed opinions to a journalist or member of the public, then stick to communicating one-to-one and make it clear you are speaking off the scientific record. Better still, don’t"
It's pretty clear that for one reason or another journals don't like to publish comments (eg read Doswell and Errico on peer-review in general and comments in particular). Here's another anecdote I've never blogged about. It is an arithmetic error I spotted in Levitus' seminal ocean heat content paper way back in 2002. It's a just a simple error in a linear regression, so the facts are not in doubt - I was persuaded in the end (see the linked thread) to write a couple of sentences to Science pointing it out but the editor decided, aided by an extraordinary volume of bluster from the original authors, that it was not worth publishing. The data have long since been superceded but it annoyed me at the time that both Science and the authors themselves were quite happy to see a simple arithmetic error (which just coincidentally happened to exaggerate the ocean warming, and showed a rather better agreement with models than the correct analysis would have done) remain uncorrected in the literature and be used in further analyses. (Yes, looking back at that episode I now see I was rather naive at the time, having only recently shifted into climate science. I am sad to say that such behaviour would no longer strike me as unexpected.) But the idea that I should somehow be morally obliged to censor myself because an editor didn't want to devote any space to publishing that small correction is patently absurd. Equally silly is the suggestion that I should not point out the glaring errors in Chylek without feeling obliged to write a short paper. It's a shame that comments seem to be taken as such a personal insult - as I've said before, the only scientist who's never made a mistake is one who's not done any science, although I'm not suggesting that all mistakes merit a published correction (journals would be overwhelmed by trivia). But I know of two recent cases where people declined to co-author a comment due to concerns about offending the (more powerful) recipient. In both cases the potential author was untenured, and one of them explicitly cited that as the major factor in their decision. It's hardly a sign of healthy science when people are too scared to say what they think, on blogs or elsewhere. It's that time of year again. And this time we are (unusually) not rushing to or from any conferences so are able to make the most of it. I'm not sure if the cherries are really particularly good or if it's just that we are not in so much of a rush. Yesterday we walked into town early in the morning to catch a train to Tokyo to attend a set of presentations from an INQUA committee, so we got to see central Kamakura at its quietest and most beautiful (most days we cycle and miss the town centre). I think the real reason for their trip was to meet with the equivalent Japanese organisation. They chose a good time of year for it! Looks like the fun is set to continue for a little while longer, cos I've got Corbyn's April forecast. He thinks that April will be cool and rainy. This month he has unhelpfully split the Central England Temperature region into no fewer than three sections, so I'll make an estimate of the average: the SE chunk is predicted to be from -0.5 to +0.5C, the western chunk is -1 to 0C and a northern wedge is -0.8 to 0.2C - all values compared to the 1961-90 mean which is 7.89C for the CET series. So I'll take the overall average of that to be -0.75 to +0.25C and anything in that range (7.14 - 8.14C) will be a win for him. Rainfall is a little simpler, his forecast is 110-140% for the west and 95-130% for the east and north, so I'll allow 100-135% to count as a win. As for notable events, the Grand National (5th) will be warm and dry, and the London Marathon (13th) will be positively warm or even hot. The Met Office disagrees on both counts (well they suggest the LM may be OK-ish), but what do they know? Via John Fleck, I see that Marty Weitzman's manuscript is getting more air-time. It has changed a lot since I previously wrote about it, but my fundamental criticism remains unchanged. You have to read through about 15 pages of background and overview to get to it, but the crux of the argument is as follows. Marty describes the situation as if climate sensitivity S "has a pdf" of unknown width, and our process of learning about the width of its pdf is akin to drawing samples from "the pdf of S". In this case, our estimate for the next sample from the pdf will be a long-tailed pdf. However, I think that S is best considered as an unknown constant, and we learn about S by making imprecise observations of it. In this case, our pdf for S (and our next observation) may or may not have long tails, depending on the nature of the observations and their errors. This distinction is not a purely semantic one, but is fundamental to the whole process of estimation - ie, are we estimating the (finite but unknown) width of a pdf, or the location of a parameter? I think that basically all of the climate science literature follows the latter point of view (there is some oddball stuff that is sufficiently ambiguous that it's not clear what the authors intend). To be perfectly honest, I don't even know what it might mean to say that "S has a pdf" from which we draw samples. Drawing samples from a pdf is an inherently frequentist construct. In my worldview, we can treat observational error (including natural variability) as a pdf from which we sample, because we can in principle make more observations. But I don't see at all how we can sample from "the pdf of S". The fact that we will never know S precisely, and thus any estimate of S will always take the form of a pdf, is not the same thing at all. This latter pdf is "my pdf of S" and is fundamentally attached to me, not S. Any future observations that are taken will not be influenced by my beliefs about S - the thermometer can't tell who is reading it and change its output accordingly! As far as I can tell, nothing in Marty's basic argument is specific to climate science and climate sensitivity. If he is correct that S naturally has a long tail, then his argument appears to apply equally to all Bayesian estimates of all unknown parameters in all fields of science. I find this a priori unlikely. I've had a frustrating time trying to debate this with Marty, and am still unclear at which point he parts company with my argument. He certainly seems to agree that the two viewpoints about the nature of S are fundamentally incompatible and that his argument rests on taking his particular approach. I've tried to get Andrew Gelman to read and comment on this manuscript, so far to no avail (mind you he seems to have gone off Bayesian statistics recently). I'd also be interested in hearing the views of any other people who really do know about Bayesian statistics. A quick update on the March results: Corbyn gets a fail on the temperature (he predicted colder than normal, it was warmer according to here and here - note that "normal" in his terms is the 1961-90 mean, which was 5.67C) but a success on the rain - he said upwards of 130% of normal, and Philip Eden says we had 135% (I'm simplifying Corbyn's forecast here a bit, since I don't have precise regional data). As before, I'm ignoring the sunshine on the basis that this is essentially the converse of the rainfall forecast: for the record, he was actually wrong. I hope someone will supply April's forecast. If he gets the next 7 months spot-on (temp and precip) he'll be up to the 80% rate that he claims, and I will eat my hat, video the event and post it on Youtube.